In need of a quick and easy weekday dinner that’s just a bit different? 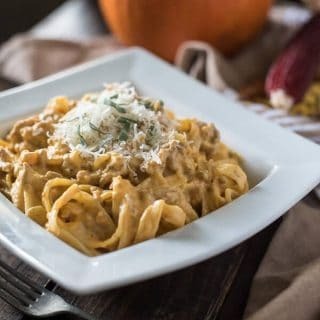 This Pumpkin & Sausage Alfredo combines everything you love about alfredo with all things fall and comforting! The end of quite a crazy week has finally arrived! I don’t know about you, but I am freaking exhausted. My vacation is exactly two weeks away, and I’m so beyond ready for it. It’s a half staycation, half house-hunting vacation. Shh. Don’t tell on us, internet, but we might be relocating verrrry soon! But, that’s still a few handfuls of days away. Today is today, and in the interest of relaxation and enjoying the gorgeous weather descending upon us, how about a quick 30-minute, no-nonsense, comforting bowl of pasta? I think tonight is going to be about cuddling with the hubs and the pooch, catching up on some nerdy television (anyone ever hear of a show called Sherlock? 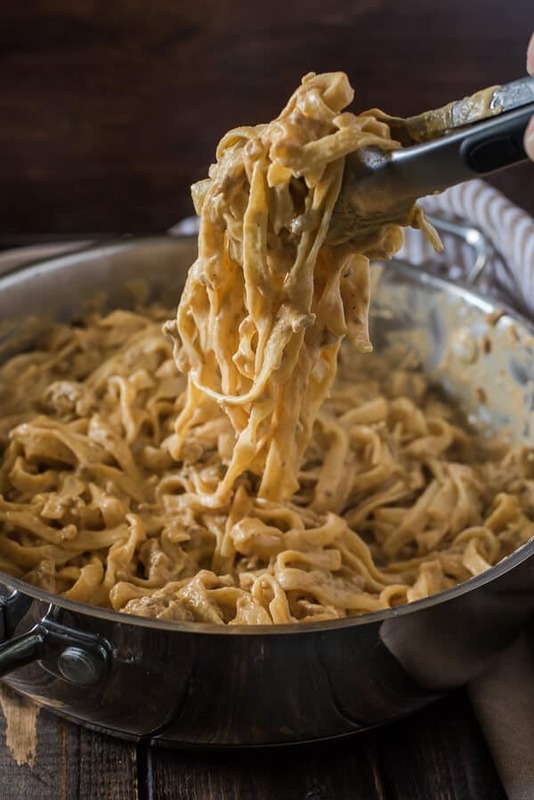 Whoa,) opening a nice bottle of wine, and indulging in a big bowl of creamy, cheesy, soul-quenching pasta. 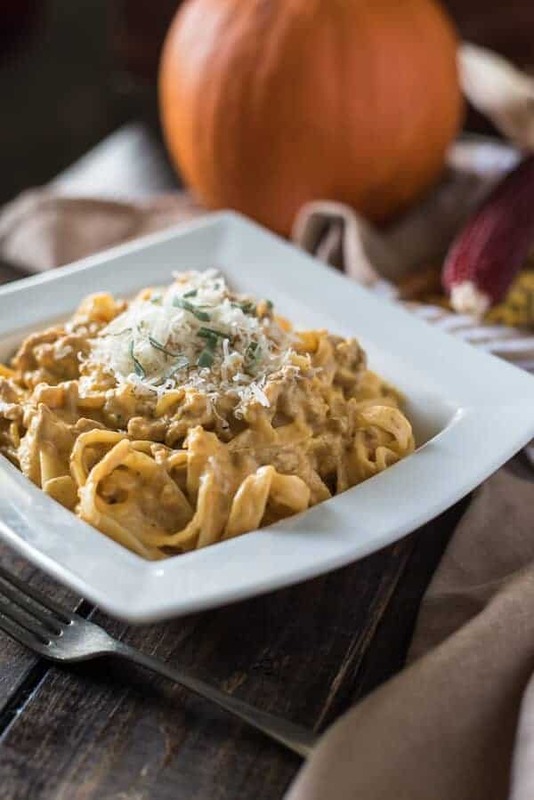 As if you could make fettucine alfredo better…just add pumpkin. I’m sure haters still gonna hate, but I promise you, it’s not at all like a PSL. It adds a dimension of creaminess that you’d never expect from pureed squash, and the flavor melds so well with the cream and Parm, it’s almost ridiculous. And then you add the sage and Italian sausage and it’s all hearteyes, I promise. So much fall flavor in every bite. It’s a must-try, folks! ….why are you still reading? Print this and go make it! Your belly is waiting!!! In need of a quick and easy weekday dinner that's just a bit different? 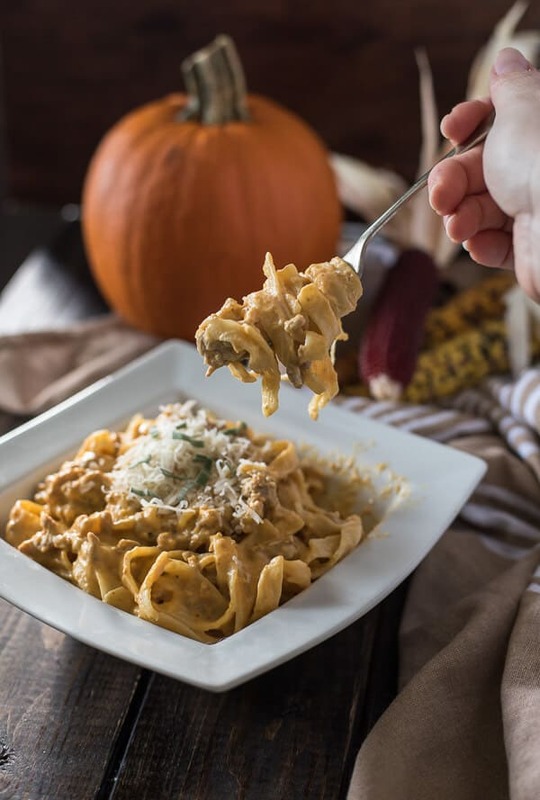 This Pumpkin & Sausage Alfredo combines everything you love about alfredo with all things fall and comforting! Cook the pasta according to package directions, reserving 1 cup of the pasta water. In a skillet over medium heat, brown the sausage until thoroughly cooked. Remove from skillet into bowl and set aside. Return skillet to stove top and heat the butter over medium heat. Add the garlic and sage leaves, and saute 1-2 minutes until fragrant. Stir in the pumpkin puree and cream, and simmer until slightly thickened, 6-8 minutes. Return the sausage to the skillet and add the cheese and salt to taste; stir to combine. Stir the pasta into the skillet, thinning as needed using the reserved pasta water. Top with Parmesan and chopped sage, seasoning with more salt to taste if desired. Enjoy! 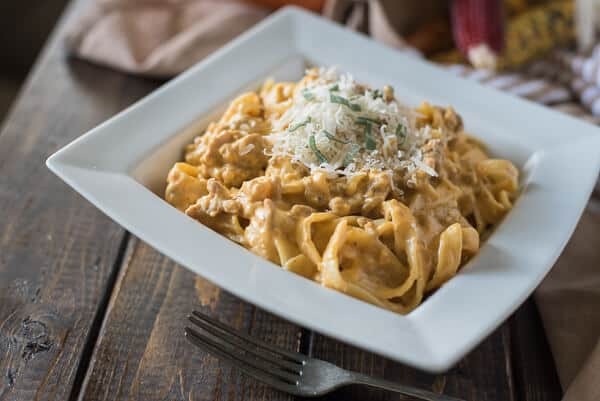 What’s your favorite way to prep alfredo?